Avenida Andaluci­a 79, 11008 Cadiz, Spain. 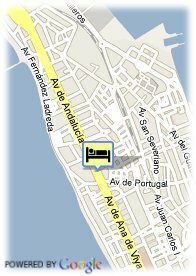 Sited on the main thoroughfare that runs through historic Cádiz, this hotel is located a short walk from the city's congress centre and old town. Set only 100 metres from some of the best beaches in Europe, the Regio 2 is a great choice for both leisure and business stays in this charming Andalusian city. Onsite, business guests can make use of the facilities in the business centre, whilst leisure guests can enjoy the sunshine from the hotel's sun terrace. If you are looking to explore the local area you will find a convenient bus stop set right outside the hotel's entrance, with routes running to all of Cádiz's historic sights. Paid covered parking at the hotel (10.70 €), Paid open air parking at the hotel (10.70 €). Beach, Near trainstation, Centre, Museum Area, Near the historic centre, Near shopping centre.